This is a 12-day cross-curricular unit for upper elementary on Saturn and its rings. It integrates reading, writing, art, and science to provide a multisensory exploration of the structure of Saturn and its place in our Solar System. The language arts focus is on reading and writing nonfiction, with explicit support in reading comprehension and note-taking. 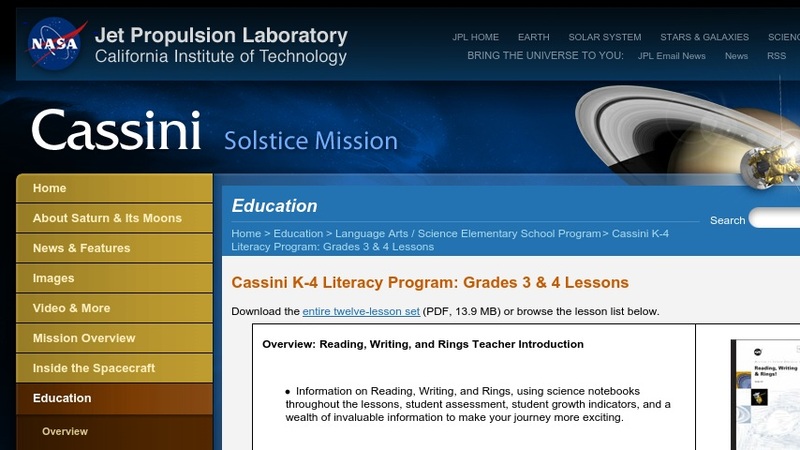 The resource provides four booklets customized for the content (both English and Spanish versions), all based on NASA's Cassini mission and Huygens probe data. Each day integrates a science or engineering activity - including a playground model of the Sun, Earth, and Saturn; drawings and sculptures; sketching prototype spacecraft and comparing their models with Cassini; and designing/testing a parachute probe. The package includes detailed lesson plans, pedagogical support, assessments, printable lab notebooks, warm-up questions, and background information. Editor's Note: This resource is thorough and well-organized, but the readability level of the four related booklets is somewhat above the level of Grade 4. See Related Materials for a less text-intensive unit on Saturn, also developed by JPL.